100% natural. 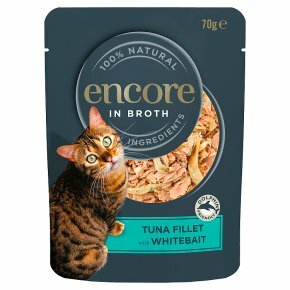 Just completely natural ingredients, lovingly made with 65% tuna & 10% whitebait.Encore Pacific Tuna Fillet with Whitebait Cat Food contains nothing more than the 4 ingredients listed and is a completely natural complementary pet food for adult cats. Feed with other Encore complete wet and dry cat food for a balanced diet Suggested daily feeding: Fresh drinking water should be made available at all times, serve at room temperature. Daily allowance See pack for full feeding instructions.